Part Used & Method for Pharmaceutical Preparations: The ripe seeds are gathered in autumn and then dried in the sun and used unprepared or stir-baked. Functions: To strengthen the spleen and transform dampness. 1. Deficient spleen not transforming and transporting water manifested as lassitude, poor appetite, loose stool or diarrhea, or leukorrhea due to downward flowing of turbid dampness. 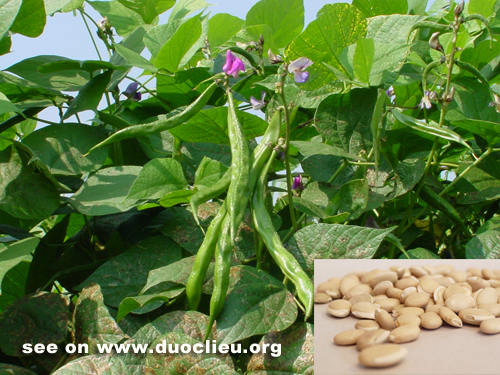 Hyacinth bean (Biandou) is used with Ginseng (Renshen), White atractylodes (Baizhu) and Poria (Fuling) in the formula Shen Ling Baizhu San. 2. Disharmony of the spleen and stomach due to invasion from exogenous pathogenic summer-damp-heat manifested as vomiting and diarrhea. Hyacinth bean (Biandou) is used with Elsholtzia (Xiangru) and Magnolia bark (Houpo) in the formula Xiangru San. Dosage: 10-20 g, decocted in water for an oral dose. It is used stir-baked for invigorating the Spleen to stop diarrhea, and used unprepared for relieving Summer Heat. Cautions & Contraindications: The raw herb is used for relieving summer-heat, the fried herb for strengthening the spleen and stopping diarrhea.